The recently announced Logitech Pure Fi Mobile Speaker System will allow you to wirelessly playback audio from your Bluetooth enabled mobile phone with high fidelity, stereophonic sound. Dual 2-inch Max-X high excursion drivers ensure a full, balanced audio. The bass response is delivered via 2-inch pressure drivers. Logitech's Stereo XL technology is also supported and optimises acoustic levels for a full, rich sound. The Logitech Pure Fi Mobile Speaker System can also be used as a wireless speakerphone thanks to two integrated microphones. One microphone blocks unwanted background noise while the other mic picks up voice. Bluetooth devices must support the Advanced Audio Distribution profile (A2DP) to be compatible with this speaker system. Compatible devices may include PCs, iPods, MP3 players and of course Mobile phones. USB connectivity is also supported and allows the user to make calls or listen to music from their PC. Rechargeable batteries are included and can last for up to 12 hours. They can be charged via a supplied power adapter or USB cable. This is a Bluetooth class 2 device with an operating range of up to 10 meters (33 feet). The Logitech Pure Fi Mobile Speaker System is expected to be available in the US and Europe in in June for a suggested retail price of US$149.99. Developed with Smartphone and BlackBerry users in mind, the Freedom Keychain GPS 2000 is a compact unit that can add GPS functionality to your mobile phone, PDA or notebook. This Freedom unit connects to your mobile phone via Bluetooth and works with a range of GPS mapping software applications such as Google Maps that run on your phone. 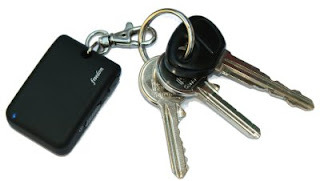 Attaching to a key ring makes a lot of sense for a portable GPS unit because the two items which we almost always have in our pockets are our keys and mobile phone. As long as the batteries are charged and we have coverage, GPS access should always be at our fingertips. There is a range of mapping applications that will work with the Freedom Keychain GPS 2000 and some are available for less than US$10. Some of the more popular GPS mapping applications include AA, Active Pilot, BlackBerry Maps, CoPilot Live 6, Gate 5, Google Maps, Mapquest, Memory Map, Navigation Mobile, Navman, Nokia/Smart2Go, Route 66, Spot, Telenav and Wayfinder. Three lights are located on the top of the unit to indicate Bluetooth, GPS and Battery status. A power indicator light is on the side of the unit. The Freedom Keychain GPS 2000 features a rechargeable 350mAh Lithium Polymer battery with a working time of up to 9 hours. The device is charged via USB and standard and car charger USB cables are provided. The GPS can stay on the key chain while it is being charged. 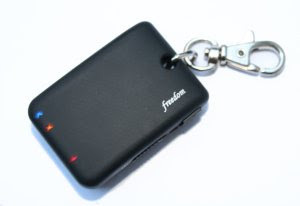 The Freedom Keychain GPS 2000 is available now for a price of $99.99 or £59.99. The new etyBlu Bluetooth Headset from Etymotic Research Inc features two microphones - one located internally at the end of the earpiece and one at located in the BLUmaxx boom. The microphone located in the boom features noise cancellation. The boom microphone and an in-ear noise isolating earphone work together to provide clear, high quality sound at both ends of the conversation in environments with high background noise. The etyBlu noise canceling boom microphone can be quickly plugged in when required for noisy environments. When the boom is unplugged, the internal microphone automatically takes over. 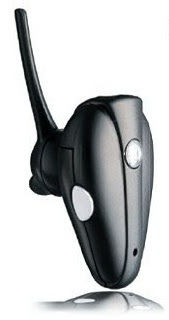 This Bluetooth Headset is compliant with the Bluetooth Core Specification 2.1, Headset 1.1 and Handsfree 1.5 profiles. The etyBlu Headset is a class 2 device with an operating range of up to 10 meters. Talk time is up to 7 hours and standby time is up to 100 hours. The etyBlue Bluetooth Headset is available to buy now for a recommended retail price of US$129. 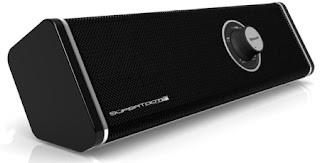 The Supertooth Disco Bluetooth Multimedia Speaker allows stereo music to be streamed from Bluetooth enabled (A2DP) mobile phones, PDAs or computers. A powerful sound is delivered from an internal 12 watt subwoofer and Left Right 2x8 watt (RMS) audio power amplifier. The subwoofer speaker uses a Neodyne high efficiency system and the Left Right full range speaker features a parabolic membrane. All of the speakers are magnetically shielded. The Supertooth Disco Bluetooth Multimedia Speaker supports the Bluetooth A2DP Advanced Audio Distribution Profile, SBC Stereo streaming and the AVRCP Audio Video Remote Control Profile. The AVRCP profile allows remote control of the Play, Pause, Stop, Previous and Next commands. This is a Bluetooth class 2 device with an operating range of up to 10 meters. For complete portability, the Supertooth Disco features an internal re-chargeable battery. The charging time is 3 hours and the standby time is up to 1500 hours. A cabled connection is also provided for iPods and MP3 players without Bluetooth. Starnex, a South Korean manufacturer of micro portable CCTV systems, are currently developing the SG-400 Self Guard DVR (Digital Video Recorder) Pen. This Bluetooth enabled pen will support recording speeds of 30 frames per second at resolutions of 320x240 or 640x480 pixels. Other cool features include motion detection activated recordings, audio detection activated recordings and 5 motion detection sensitivity levels with selectable areas for motion detection. An alarm can be sent wirelessly to a remote site when motion gets detected. The SG-400 Self Guard DVR Pen has been designed for low power consumption and uses a high performance data compression algorithm for extended recording times. Internal storage is supplied with Flash memory and a microSD card. Bluetooth support provides wireless connectivity with devices such as PCs or PDAs. No release date has been specified by Starnex but limited samples have been made available this month. And just incase you were wondering, yes, the SG-400 can also be used as a standard pen. The Bluetrek BIZZ is the worlds first Bluetooth Headset to also operate as a USB Flash memory device. Marketed as a 3 in 1 device, the BIZZ also supports direct charging via USB. Supporting microSD cards, you can use this device to move files between your mobile device and computer. The detachable speaker cover exposes the USB connector and allows the memory card to be inserted or removed. Support is provided for MicroSD cards with up to 8GB of storage space. Bluetooth functions of the BIZZ include voice dialing, pairing in headset or hands free profiles, take/end call, redial, reject call and call waiting. Detachable ear hooks are provided to allow the headset to be worn on either ear. 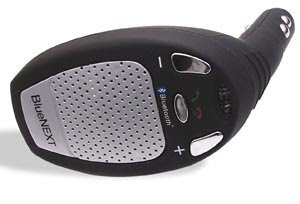 Devices that are compatible with the Bluetrek BIZZ Bluetooth headset include mobile phones, PDAs and computers that support the Headset and or Hands free profiles. The talk time is up to 6 hours and the standby time is up to 10 days. A travel charger, USB cable, lanyard, ear buds, manual and ear hooks are all included in the box. 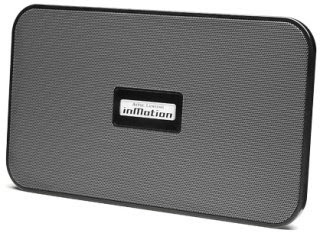 The inMotion SoundBlade is the first Bluetooth stereo speaker system from Altec Lansing. The SoundBlade allows Bluetooth stereo music to be streamed from devices compatible with the A2DP profile, such as MP3 players, mobile phones and computers. High quality sound is delivered from dual 2.5 inch full range high output drivers, SRS TruBass and full v.2 Bluetooth stereo. GSM/CDMA shielding are provided to prevent speaker buzz. Additionally, a built in echo canceling microphone allows your Bluetooth mobile phone to be used as a speakerphone. 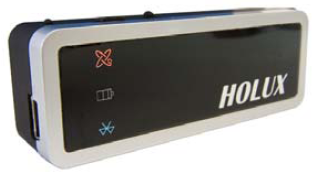 Mobile devices that support the Bluetooth AVRCP (Audio Video Remote Control Profile) can be used as a remote control for the inMotion SoundBlade. Volume, mute, next track and previous track commands are all supported. Both battery and AC power sources are supported. 6AA batteries will give the SoundBlade up to 24 hours of continuous playback. This devices is also very portable at only 1 inch thick and weighing 455 grams - ideal for Bluetooth audio on the go. With the Sony DRC-BT15 portable Bluetooth receiver, you will be able to use almost any pair of headphones as a Bluetooth stereo headset. This device allows music to be streamed wirelessly from Bluetooth enabled music sources such as mobile phones, portable music players, PC's etc and played back through your favorite headphones. The DRC-BT15 is lightweight and measures less than three inches long. It's a highly portable device that can be clipped to your clothing or an arm band etc. The user interface consists of a toggle control that allows the user to adjust the volume or play, pause, fast forward, rewind the music that is being streamed. Compatible devices must support the Bluetooth AVRCP or Audio/Video Remote Control Profile. An embedded microphone is also supported to allow hands free calls when paired to a Bluetooth enabled mobile phone. The battery is a rechargeable lithium-ion and can deliver up to six hours of music playback or talk time. 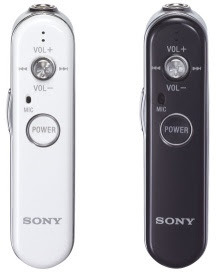 The Sony DRC-BT15 Stereo Bluetooth Receiver is available from March 2008 for around US$130. The recently released SRS-BT100 Bluetooth speaker from Sony allows you to stream music from an MP3 player, mobile phone or PC. With high powered 30 watt amplifiers and MegaBass technology, this speaker system is claimed to deliver a rich sound quality. The speaker searches for compatible Bluetooth devices in range and lets you choose the music source you wish to pair with. Audio can be managed from the paired device and the Bluetooth AVRCP profile allows you to remotely control the volume. A stereo audio input jack is also supplied to allow the playback of music from non Bluetooth devices. 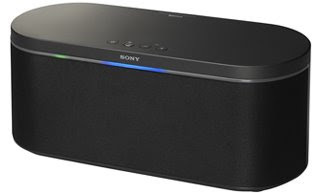 The Sony SRS-BT100 Bluetooth speaker is available from March 2008 for around US$160. IOGEAR's Bluetooth Hands Free car kit, the GBHFK211W6, provides many convenient features for full hands free operation while you are driving. It wirelessly manages calls with your mobile phone over Bluetooth to allow you to keep both hands on the steering wheel. This Bluetooth car kit attaches to your sun visor with a supplied clamp and is operated with easy to reach controls. There are four buttons in total, two on each side of the unit. One set of buttons is for taking or ending calls and the other set is for adjusting the volume up or down. Compatibility is provided for most mobile phones that support the Bluetooth hands-free and headset profiles. The Car Kit is compliant with the Bluetooth version 1.2 specification. Digital Echo Cancellation and Background Noise Reduction are provided for enhanced sound and voice quality. The IOGEAR Bluetooth Hands Free car kit provides a talk time of up to 8 hours and a standby time of up to 150 hours. This is provided with built-in rechargeable batteries that can be recharged though a provided USB charging cable or Car Charger. VoIP functionality is also provided which means that you can make VoIP phone calls with a Bluetooth enabled computer. Supported operating systems are Windows 98SE, ME, 2000, XP and Vista. The BN608 is one of the latest Bluetooth Car Kits from BlueNext. This device has been designed for portability and ease of use. Installation is simple, just plug the device into the cars cigarette lighter to charge. The next step is to pair the device with your mobile phone. Conforming to Bluetooth standard V2.0, the BN608 supports an operating range of up to 10 meters (class 2). Two microphones are provided, one mini microphone and another one with an extension cable. The purpose of the microphone with the extension cable is to get the best quality voice signal and for the convenience to talk for people in the back seat. BlueNext claim that the external microphone produces a loud and clear sound for ease of communication. The BN608 user interface is simple and consists of three buttons, Volume +, Volume - and a multifunction button (MFB). The MFB is used for paring mode and turning the car kit on and off. The Jays BlueStreamer 2 Bluetooth stereo music adapter lets you stream music wirelessly from your mobile phone and listen to it through any headphones with a 3.5mm jack. This device elminates the wired link from your phone to your headphones. 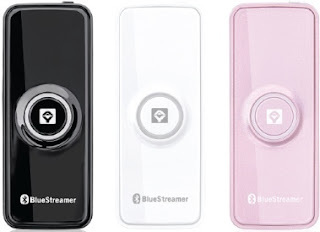 At only 12g, the BlueStreamer 2 is a very light device and can be attached to your shirt or bag with the supplied attachable/detachable holder case. It is available in Black, White or Pink. The 3.5mm jack allows for a wide range of headphones to be plugged into this Bluetooth music adapter. Jays earphones are also compatible with this device. The Jays BlueStreamer 2 automatically switches between music and calls. When a call is picked up, the music is turned off and when the call has ended, music is turned back on again. There is no need to worry about missing a call when you have the volume turned up. Another nice feature is the support for charging through USB. Simply plug the supplied USB cable into a spare USB port on your computer and start charging. The Jays Car Charger can also be used to charge the BlueStreamer while on the road. The new Bluespoon AX2 Bluetooth Headset is a 3rd generation device featuring a light weight and efficient design. The AX2 comes as the result of intensive development from Bluespoon that started in late 2003. Weighing only 10 grams, this headset uses the latest Li-ION technology and features a 2.4Ghz antenna with high efficiency and a long range of at least 30 feet. The user interface of the AX2 consists of a 3-button design, one large multifunctional button on the top of the headset and two smaller buttons, one on either side of the unit. Compatibility for left and right ear users is provided by a soft-tip back piece that can turn 360 degrees. The Bluespoon AX2 Bluetooth Headset provides a mini-USB port that can be used to recharge the Li-ION user exchangeable battery. Compatibility for a wide range of devices is provided through support for the Bluetooth Headset and Handsfree profiles. Up to 8 different devices can be paired with the AX2. 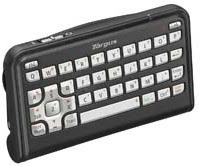 The Targus Bluetooth Thumpad provides a standard 39 QWERTY interface for simple data entry into SmartPhones, PDAs and Pocket PCs. Featuring Bluetooth wireless technology, this thumpad provides a convenient, portable and cable free method of adding keyboard support to your mobile device. Installing the software requires connecting your mobile device to your computer and installing the software from a supplied CD-ROM. The next step is to reset your mobile device, establish a connection with the Targus Bluetooth Thumbpad and setup driver settings such as key repeat delays. After the software has been setup, you can simply lay your mobile device down on a table or cradle and start typing. Alternatively, the Targus Thumpad can be attached to the bottom of your device with a provided clamp. For gaming enthusiasts, a 4-way game control pad with easy to use keys and a backlit keypad for night use is provided. The Holux M-1200 Wireless GPS Receiver uses Bluetooth technology to provide a cable-free connection with compatible devices running map software such as TomTom. Featuring the MTK MT3318 Low power consumption GPS chipset and weighing only 30 grams, the M-1200 is a highly portable device making it well suited to a wide range of applications. With dimensions of 67 x 23 x 16mm, it will easily fit inside a pocket or bag. The built in battery is Lithium-ion with a working time of up to 23 hours. 32 parallel satellite-tracking channels are supported for fast acquisition and reacquisition. The built in WAAS/EGNOS Demodulator doesn't require any additional hardware. Or the high-sensitive software can be used to get fast acquisition and re-acquisition in urban, canyon and foliage environments. The Holux M1200 Wireless Bluetooth GPS Receiver is compatible with devices that support the Bluetooth Serial Port Profile (SPP). This could include laptops, PCs, PDAs or mobile phones. Applications could include Personal navigation, mapping device applications, car navigation, marine navigation, fleet management, AVL (Automatic Vehicle Location) and Tracking Systems. The LM Technologies LM056 EDR (Enhanced Data Rate) Bluetooth adapter allows you to connect to your Bluetooth enabled device over an impressive range of 250m (750 feet). 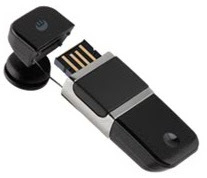 This device is unique as a Bluetooth class 1 adapter as most other class 1 devices are still in the 100m range. The LM056 uses the Broadcom BCM2045 EDR Chipset and is compatible with V5 and V6 of the Widcomm Bluetooth stack software. It is compatible with the Bluetooth specification V2 EDR and is backward compatible with V1.1 and V1.2. A wide range of Bluetooth profiles are supported making the LM056 Bluetooth adapter suitable for VOIP, Stereo Audio and many other applications. Compatibility is provided for Windows 98Se or later and Mac OS X or later. The Motorola EQ7 Bluetooth Stereo Speaker provides Hi-Fi wireless sound with a deep rich bass. 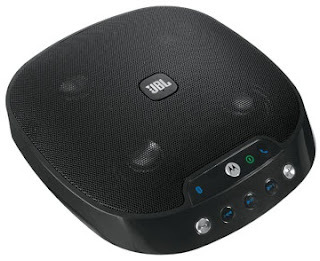 A speakerphone function is also provided with integrated controls to make it easy to switch between music and calls with the touch of a button. Premium quality sound is delivered thanks to a tuned-ported enclosure, combined with four aluminium dome Odyssey transducers driven by powerful neodymium magnets. A deep rich bass with a smooth response is provided clear out to 20 kHz. The Motorola EQ7 Bluetooth Stereo Speaker is a class 1 Bluetooth device, providing wireless audio up to 100 meters. It can easily connect wirelessly with an MP3 player, PC or mobile phone using the Stereo Bluetooth (A2DP) profile. The EQ7 also provides a 3.5mm standard audio jack to allow a wired connection with almost any music source. This Bluetooth speaker can be powered from the mains through an included AC power adapter or from four AA batteries. The EQ7 is expected to become available in the second quarter of 2008. The Freedom Universal keyboard converts your mobile device into an easy to access laptop. This is the world's only dual standard full sized folding keyboard and is compatible with over 200 devices that support Bluetooth connectivity. It features a full five row AlphaNumeric keyboard with full sized keys that have the quality "scissor action mechanics" giving the user the feel and feedback of a desktop keyboard. There are 65 keys in total, including an Esc button, shortcuts and programmable keys for specific tasks. This keyboard is available in QWERTY English and QWERTZ German versions. The Freedom Universal keyboard features dual standard HID and SPP Bluetooth profiles, offering compatibility across a wide range of devices from many leading brand names such as Asus, BlackBerry, Dell, HP, HTC, i-mate, Nokia, Palm, Sony Ericsson. The Bluetooth HID (Human Interface Device) profile is the most common profile used for PDAs, Smartphones, Laptops and PCs. The SSP (Serial Port Profile) provides serial port emulation and is used by all BlackBerry devices. This keyboard is a Bluetooth class 2 device, giving it a transmission distance of up to 10m. Over 200 devices that have Bluetooth connectivity are compatible with the Freedom Universal keyboard. Compatible device operating systems include BlackBerry OS 4.0 or higher, Symbian (Series 60) v6/v7/v8/v9, Palm OS5, Windows Mobile 03 PPC, Windows Mobile 05 PPC, Windows Mobile 03 Smartphone Edition, Windows Mobile 05 Smartphone Edition, Windows XP*, Windows 2000*, Mac OS X Tiger* and Linux*. *Using HID profile mode. Product ranges include Acer, Asus, Audiovox, BenQ, BlackBerry, Dell, Dopod, E-Ten, Fujitsu, Hewlett Packard, HTC,i-Do, Mac, Motorola, Nokia, Qtek, Palm, Panasonic, PC, Samsung, Sendo, Siemens, Sony Ericsson. The recommended retail price for the Freedom Universal keyboard is $US99.99. - 145 x 98.5 x 19.5mm (511/16" x 313/16" x 3/4") folded Weight 204g. 7 oz. including batteries. Not only does the Parrot RK8200 FM/AM RDS car stereo feature an impressive array of digital and analog connections, it also provides a built in Bluetooth hands-free kit with sophisticated telephony functions. Both music and voice conversations are reproduced over the vehicles speakers. Featuring an iPod connector, USB Flash drive port, USB MP3 player, SD card reader and a line-in socket for analog sources, the RK8200 certainly provides users with many choices on how they supply their digital music. Playback is also supported for files sent from any Bluetooth enabled mobile phone or player that is compatible with the Bluetooth stereo A2DP profile. A 1GB internal Flash memory is also available for storing MP3 music. The Parrot RK8200 provides advanced hands-free functions that include automatic phonebook synchronization and TTS speech synthesis. There is no need to take your phone out of your pocket when making a call, simply browse the list of contacts on the car stereo's screen and say the names in the phonebook. When a call is received, music is automatically muted and the contacts name is displayed. At the end of the call, music will automatically switch back on. The RK8200 also implements Parrot's new DCBM (Dynamic Choice or Best Microphone) noise reduction technology to provide crystal-clear, fully intelligible voice conversations. A bright 2.4-inch TFT screen with 262 144 colours, large rotary command button and a practical storage compartment located behind the front panel are the standout features of the RK8200's user interface. The combination of the bright TFT screen and rotary command button allows users to easily browse through their music library, album covers, artist's names and tracks. The front panel can be removed to provide access to a practical storage compartment where a mobile phone, USB Flash drive or MP3 player, etc, can be stored. Bluetooth hacking has gained popularity recently with an increasing amount of software becoming available to hackers for gaining access to Bluetooth devices. Most of the hacking tools seem to be for the Linux platform and include names such as BlueScan, BlueSniff and BTBrowser. Bluesnarfing involves gaining unauthorized access to a Bluetooth enabled device for the purpose of accessing or stealing personal information or files. This form of Bluetooth hacking is probably the most difficult for the hacker to achieve and recent firmware upgrades to Bluetooth devices have reduced the risk. Your best form of protection is to not leave your phone is discoverable mode. Bluejacking is a mostly harmless activity and usually involves sending a vCard (electronic business card) to another Bluetooth device with an offensive message in the name field. As most Bluetooth devices are still in the 10 meter range, the person who "Bluejacked" you is likely to be in the same room. Bluebugging involves hacking into a phone using device commands without the user noticing. If the hacker were successful, they could listen in on phone conversations, make phone calls and send or receive text messages. Bluebugging has a similar result to bluesnarfing but exploits a different vulnerability that is found in older phones. Should you be concerned about Bluetooth hack attempts? Probably not due to the fact that most Bluetooth devices are still in the 10m range and there have been recent firmware upgrades to make Bluetooth devices more secure. If you are concerned, your best form of protection is to keep your devices Bluetooth turned off when not in use. And when Bluetooth is turned on, make sure you don't leave it in discoverable mode. Motorola have this month announced the S9-HD Bluetooth Headphones, an upgraded version of the award-winning MOTOROKR S9 Bluetooth stereo headphones. The Motorola S9-HD Headphones feature earbuds that reduce background noise and high-definition audio from SRS WOW HD technology. SRS WOW HD technology enhances audio performance, especially from compressed audio files, by expanding the size of the perceived sound image and creating a deep, rich bass response. All of the features that made the MOTOROKR S9 headphones so popular, are included in the upgraded, S9-HD model. They are lighter than the average pair of sunglasses (1 ounce) and feature the unique behind-the-head design for a secure, stable fit. Easy to use controls for volume, play/pause, track selection and send/end are provided near the ear pieces. Devices that are compatible with the Motorola S9-HD Headphones include any brand of Bluetooth enabled phone or music device that supports the Advanced Audio Distribution Profile (A2DP) and Audio Video Remote Control Profile (AVRCP). The S9-HD Headphones can also be paired with most iPods using the Motorola D650 Bluetooth stereo adapter (sold separately). The Motorola S9-HD is expected to be available in the second quarter of 2008. Follow the link below for information about the existing, MOTOROKR S9 model. The Philips SHB9000 headphones are the latest and most sophisticated Bluetooth headphones announced by Philips to date. They will take advantage of features in modern handsets to give pitch-perfect sound quality and all of the benefits of hands free operation. The SHB9000 Bluetooth headphones will feature FullSound, a digital audio algorithm patented by Philips that refines audio output by performing 10 million operations per second to analyze and re-compute the music signal before it is sent to the speaker. This is claimed to dynamically enhance treble, stereo effects and bass to reveal richer and more natural music details. Philips SwitchStream technology will also be supported. With SwitchStream you will hear a ring tone in your headphones when you are receiving a call on your Bluetooth enabled phone. You can then pick up the call from your headphones and return to your music after ending the call. 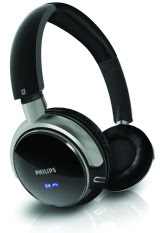 The Philips SHB9000 Bluetooth headphones will be available in the second quarter of 2008 for between US$99 and $129. 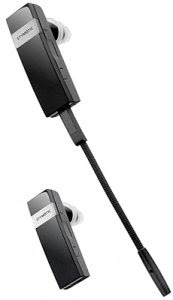 Sony Ericsson have announced the HBH-712, a high performance Bluetooth headset with a female touch. This Bluetooth headset comes as the result of extensive research by the Sony Ericsson team to find out what the active, modern woman wants. The requirements were an easy to use Bluetooth headset that looks great and fits in a handbag. The HBH-PV712 features Style-up covers that can be easily detached and are available in silver with detail, black with silver, purple and red detail and purple plated. Other fashion focused features include a silver-plated, necklace carrying solution and a styled carrying puch. The HBH-PV712 will be available globally in February 2008. The Bluetooth Special Interest Group have just announced five category winners and one overall winner for the organizations third annual "Best of CES" contest. There were forty eight new Bluetooth products submitted in the 2008 contest in categories focusing on what consumers can do with the technology. The categories were - talk on a headset, input information, listen to music, transfer information, or use in an industrial or other vertical environment. Products that complied with the Experience Icon requirements were awarded bonus points. Bluetooth Experience Icons help the user easily identify what a Bluetooth enabled device can do and how it will interact with other Bluetooth devices. All winners will receive national exposure for their winning products as part of an in-studio broadcast tour to "top 20" media markets across the US, paid for by the Bluetooth SIG. Logitech have just announced the diNovo Mini - a compact palm-sized wireless keyboard for people who have their PC connected to their TV. The diNovo Mini will allow the user to easily access music, videos and other media content from anywhere in the living room. The mini keyboard features Bluetooth 2.0, backlighting for ease of navigation and an innovative ClickPad with touch pad to point, scroll and click or as a bi-directional pad to navigate menus and make selections. 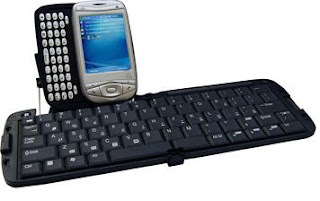 The keyboard also features hotkeys for media players and Web browsers and page up and down buttons that may be used for surfing the web or zooming in and out of documents. The ClickPad features two backlight modes. When in touch-pad mode, the ClickPad is backlighted in orange and when in media-remote mode, the ClickPads directional buttons are backlighted in green. The keyboard is always backlighted in orange. The diNovo Mini is expected to be released to the Eurpose and US markes late in January 2008 for US149.99.